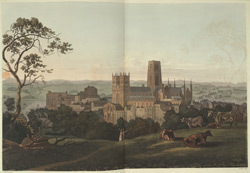 View of the south west side of the Cathedral of Durham with the Castle to the left. The first stage of the cathedral was built on the orders of Bishop William St Carileph between 1093-1135. Later additions included the 12th century Galilee Chapel at the west end, the twin west towers finished in the early 13th century, and the 15th century crossing towers. The Cathedral played an important part in the life of the town. It was a symbol of Norman dominance, and was magnificently located so it could be seen from all sides of the city. It was attached to a monastery during the middle ages. It also attracted pilgrims who came to visit the tomb of St Cuthbert. His shrine became one of the richest in England. The monastery was dissolved in the 16th century and the riches of St Cuthbert's shrine were confiscated.